Is Kefir Part of Your Probiotic Nutrition Regimen? A healthy gut with a biodiverse microbiome is essential for clear, healthy skin and overall wellbeing. 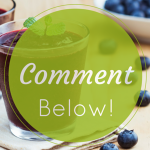 While probiotic supplements can help, the importance of a variety of whole, fermented foods cannot be ignored to keep the digestive tract working well and the immune system strong. Most people are familiar with traditional fermented foods like pickles, raw sauerkraut, miso, kim chii, and of course the most popular one: yogurt. Yogurt is popular because of its cool, creamy consistency mildly sweet and tangy flavor, and versatility. 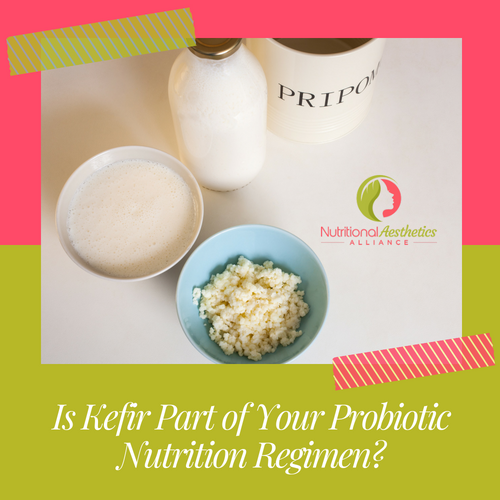 Kefir is another whole, fermented food to consider adding to your probiotic nutrition regimen because, while it shares some similarities to yogurt (it looks/tastes like a drinkable yogurt), it does tout additional benefits. Kefir is a fermented milk product that is made with live active cultures (lactic and acetic acid bacteria), and more than 23 beneficial yeast strains which help keep the not-so-beneficial yeasts (such as Candida albicans) in check. It also contains the polysaccharide kefiran (produced by the bacteria Lactobacillus kefiranofaciens), which has naturally anti-inflammatory, antioxidant, antimicrobial, and immune protective benefits. Kefir made from cow’s milk is easier for people to digest than milk or even yogurt, since the lactose and milk protein (casein) are mostly digested during the fermentation process. It also contains enzymes that help any remain proteins and sugars digest. Even though many typically dairy-intolerant people can digest milk kefir, some still have difficulty. That is why it is great that it can be made with non-dairy milks and coconut water. Kefir is very nutritious as well. It is very high in essential minerals like calcium, magnesium, and phosphorus which are easily absorbed by the body since they are partially digested in the fermentation process. This is not the case with regular milk or even yogurt. It is also rich with amino acids, and Vitamins B1, B12, biotin, and Vitamin K. These nutrients work together with other vitamins we get from food to help them absorb more effectively. Buy kefir or make your own? There are both dairy and non-dairy kefirs available at most health food stores, and even some conventional grocery stores, but they often contain added sugar, and can be pricey. Most are are also pasteurized, which kills all the “good” bacteria along with the bad, so they do not offer as much of a health benefit as one you would make yourself from a live culture or kefir grains. Kefir is very easy to make at home (make sure you follow the manufacturer’s directions on the culture starter EXACTLY and sterilize all pots, utensils, jars, lids, tongs and anything else the kefir will come into contact with thoroughly to prevent pathogenic bacteria from entering the batch), and it is very inexpensive to do so. If you are buying it from the store, make sure you are buying a high quality preferably organic kefir with no additives, and try to find one that is unpasteurized (this is tricky in the US). If you are making a non-dairy kefir, make sure you buy one that does contain some sugar (vanilla or original formula milks contain some sugar). The cultures need to digest the sugars as part of the fermentation process. I made the mistake of making a batch with unsweetened almond milk and it did not ferment properly. I ended up with lumps of unfermented bacteria in spoiled almond milk. That culture could not be used to make the next batch and the whole thing went to waste. So if you are using a homemade nut milk or an unsweetened packaged milk, you will need to add a little sugar. See the manufacturer’s instructions/FAQs for more details. 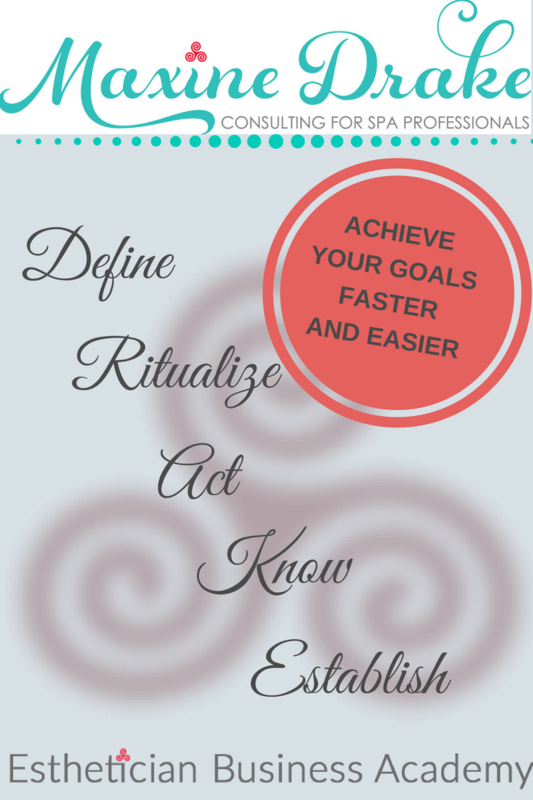 When adding fermented foods or probiotics to your diet in general, it is important to start slowly. Some people report discomfort such as bloating and digestive issues when they first start on kefir. This is because when the new friendly flora are “moving in” and kicking out the not-so-friendly inhabitants of the digestive tract, a detoxification/cleansing occurs, especially of a person has elimination issues. The symptoms will subside, but it is better to start with small doses, like one tablespoon in the morning, and gradually increase to 1 cup two to three times a day. It is also a smart idea to use kefir as an ingredient to enhance your daily meals, and fortunately, it is very versatile! Other than in breakfast cereals and smoothies, kefir can be used in several ways. It is fantastic in dips in place of cream cheese, mixed into a hummus or tzatziki, or in homemade salad dressings. It can also be blended with fruits and frozen as ice pops or if you happen to have an ice cream maker, it makes a fabulous and smooth ice cream. How do you like it? Did you make it yourself or buy it? Did you drink it plain or use it in meals? Please share in the comments below! We offer multiple NAA File Cards about fermented foods, probiotic nutrition, and microbiome health in the NAA Membership Program. These cards are quick, thorough, and relevant to use to build your own skin health knowledge, or to share with your clients. Click HERE to learn more about how the NAA Membership Program can help you build your practice and join us today! *This post contains affiliate links. Purchases made after clicking on a link in this post may result in the NAA receiving a small commission (at no additional cost to you). These commissions help us continue to provide free educational content and online events to the public. Thank you for your support!